lt;stronggt;FEL99027lt;/stronggt;lt;BR/gt;Fellowes Six-Outlet Power Striplt;BR/gt;Rugged steel housing is ideal for heavy-duty applications. Lighted on/off switch clearly displays power status. 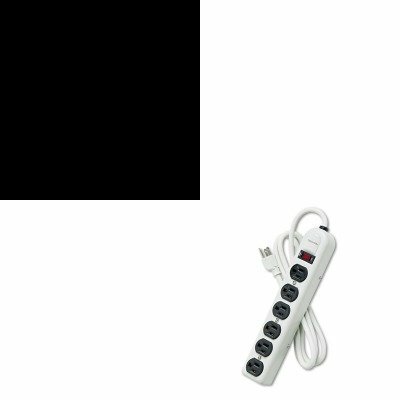 90 outlet orientation accommodates AC adapters, leaving plenty of room for other plugs. Feel more confident with a grounded plug and outlets. Power Capacity: 1,800.0 W Number of Telephone Jacks: 0 Cord Length: 6 ft.lt;BR/gt;lt;BR/gt;lt;stronggt;FEL98904lt;/stronggt;lt;BR/gt;Fellowes Six-Outlet Power Striplt;BR/gt;Precision mouse features superior optical technology for unsurpassed accuracy and control. Gel palm pad cushion provides extra comfort during extended use. Long battery life ensures hassle-free cordless mousing. Five programmable buttons and Fellowes Easy Point software for maximum customization. Connector/Port/Interface: USB Left/Right Hand Use: Left/Right Mouse Technology: Optical.